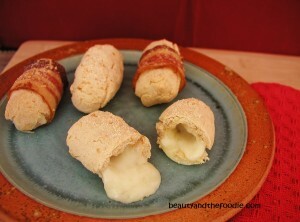 Primal, grain free, and low carb, baked mozzarella cheese stick and bacon appetizers. 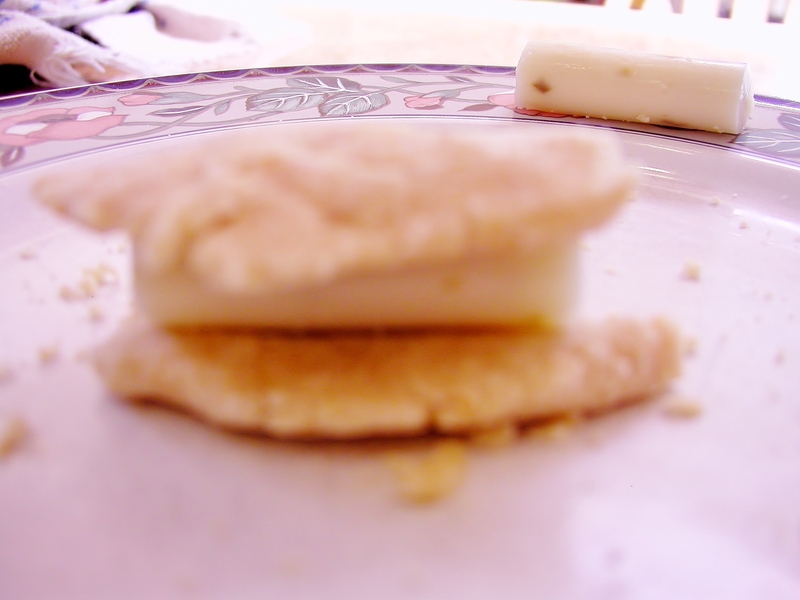 These are crisp on the outside and melted, cheese, gooey on the inside. Before I had dietary restrictions, I used to make some mean appetizers. Now that I eat grain free, and low carb, it is very challenging to make appetizers without the use of phyllo dough or puff pastry. 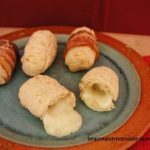 I made these with jalapeno Mozzarella cheese string cheese, but you could make with plain string cheese, if your not a spicy fan. I made some with bacon, and some without. The verdict is in, and the kids said they like the bacon ones better, not surprised. 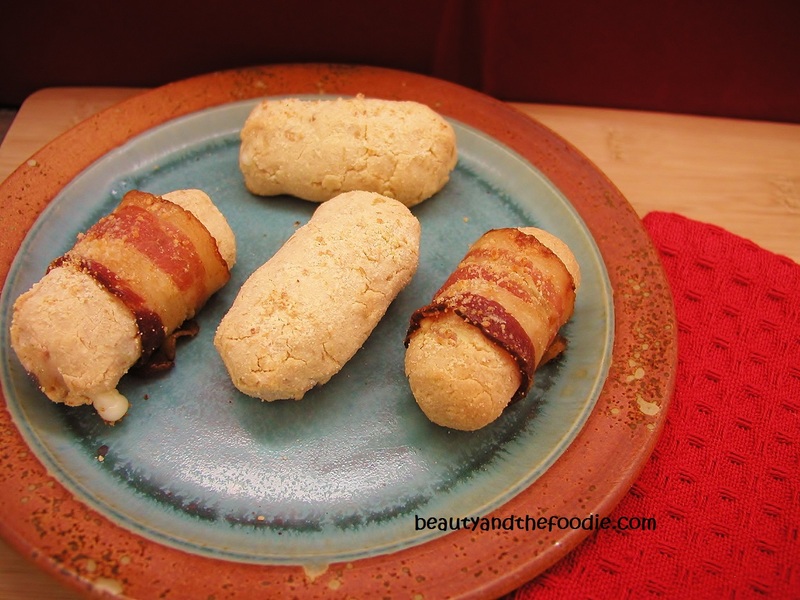 Jalapeno Mozzarella cheese sticks or plain string cheese sticks coated in a coconut flour crust, and wrapped with bacon make a wonderful appetizer. But these are baked not fried. And they are grain free and low carb! 1/4 Cup Melted Butter or melted Bacon grease..
2 tsp reserved melted bacon grease only if using the melted butter option, omit if using 1/4 cup bacon grease option. 4 slices Bacon partially baked,( nitrate free kind without sugar, I use Applegate Naturals Sunday Bacon brand). 2 tsp melted butter for brushing on dough. 1 Tbsp Parmesan cheese *optional. 1 pastry brush or sauce brush. Preheat oven to 400 F, and line a large baking dish. 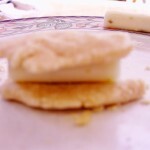 Layer bacon in dish and bake for about 13 to 16 minutes until partially cooked but not crispy, should be able to bend without braking ( see photo above). Reset oven to 350 F.
In large mixing bowl add all crust ingredients, and use a large fork to mix, mash and cut through dough until it looks like crumbly play dough. 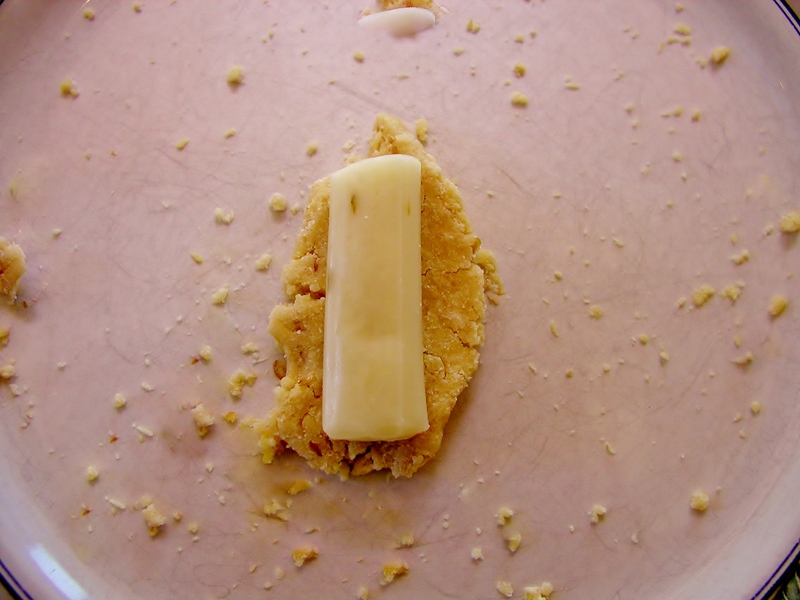 Cut Cheese sticks in half, I tried a whole stick and my hands were too small and it kept falling apart ( half sticks worked so much better). 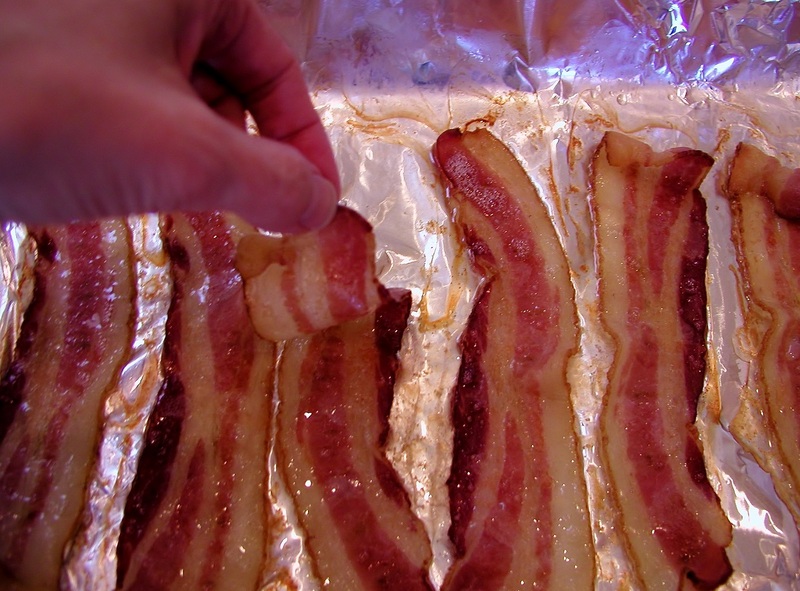 Remove partially cooked bacon from the oven and place on paper towels to cool. Save 2 tsp of the bacon grease and add to the dough mixture once cooled off ( only do this if you used butter dough option). Mix the bacon grease into dough. 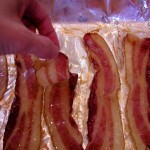 Once bacon is cooled, cut each slice in half, set aside. 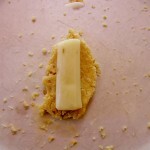 Take a handful of dough and flatten in hands and put cheese stick half on top of dough ( refer to photo above). 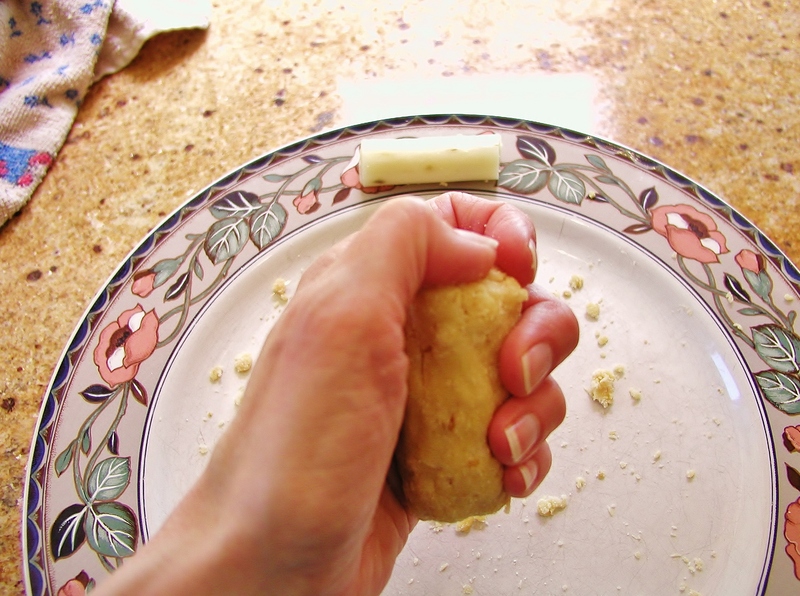 Flatten another small handful of dough and put on top of cheese stick, then take whole thing in hand and squish and squeeze dough around cheese stick, while pressing the ends in until covered ( see photo above). 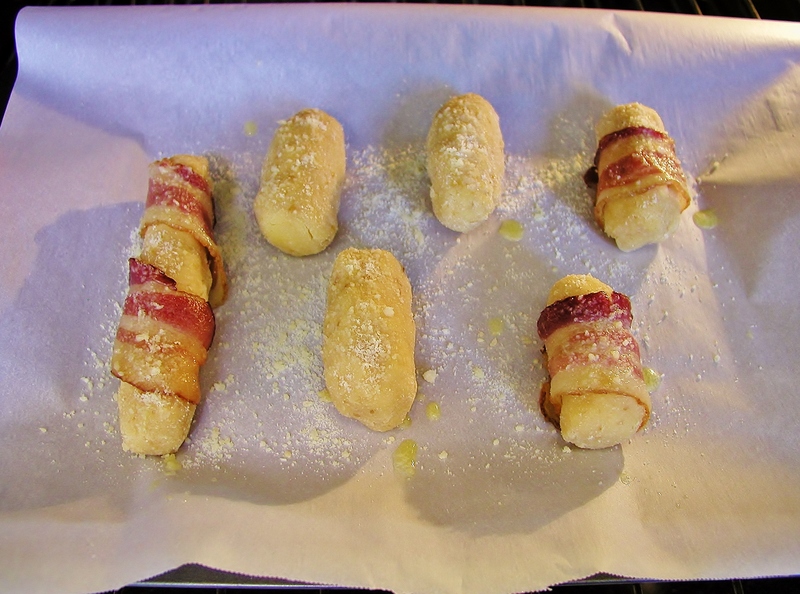 wrap with half slice partially cooked bacon and place bacon seam side down on lined baking sheet. 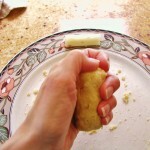 Repeat procedure for all cheese sticks. Brush a tiny bit of melted butter on top and sprinkle with optional Parmesan. Bake for 15 minutes or more until golden and bacon is more crisp ( its okay is some crust cracks a little or some cheese oozes, some of mine did, and it drys in a few minutes). Let cool for a 6 minutes or more ( don't get a cheese burn). I made this today. It was awesome thank you. I did not use bacon because I ate bacon for breakfast lol. Thank you Kim for trying the recipe and for leaving a kind comment. This looks so very good!. 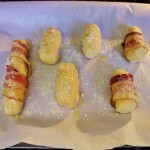 I can not wait to make this!. Thanks Kelly. let me know if you have any questions. They look so yummy! I’ve tried cheese sticks, but never made it with bacon like you. Would try it some time.